Also, I substituted honey for sugar, which not only lowers the sugar content, but also works quite nicely with the ricotta and the lemon zest. All together, they form a sweet and airy concoction, so they are a natural compliment to one another, and the combination is typically incorporated into many recipes, such as honey-ricotta breads and cakes, grilled peaches with ricotta and honey, etc, etc. Even though there's only 1/4 c. honey, believe me, that amount, along with the addition of the wine and the cocoa, makes it plenty sweet, without being cloyingly so! 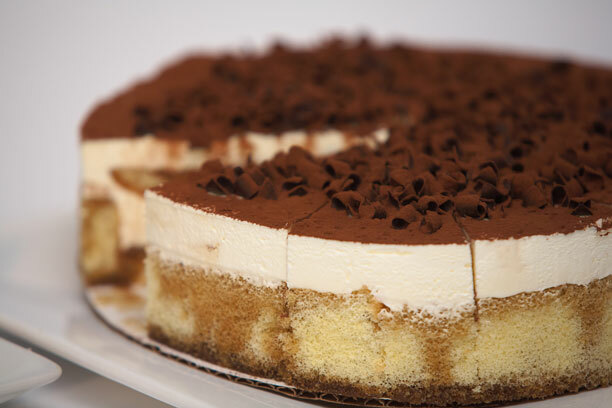 Tiramisù is supposed to be creamy and light; its slight sweetness should be perfectly balanced by a just hint of coffee flavor. In other words, a careful balance and subtlety of flavors are the main objects here. :) This is a dessert that can stand confidently on its own merits; it doesn't need to "shout in order to be heard." In addition to being lower in fat & sugar, another major advantage of this particular recipe is that it's also a lot quicker to make than many other recipes: There's no coffee to brew, & you are basically just combining all the ingredients and placing them into a glass dish. :) Can't get much easier than that! Directions: Separate egg yolk from egg white, place into 2 small bowls, & set aside. Combine egg yolks, 1/2 Tbsp. expresso, honey, vanilla, & wine into a large electric mixing bowl. Beat for 1 minute on high speed. Add ricotta, mascarpone, & lemon zest, & beat for another 2 minutes on high speed, until smooth. Remove bowl from machine base & put aside. (Or, if you've only got one bowl for your electric mixing stand, transfer contents into another bowl, & be sure to thoroughly wash the mixing bowl before re-using; the residue of other ingredients will react unfavorably with egg whites & make them harder to whip into stiff white peaks.) In a separate mixing bowl, beat egg whites on high speed until stiff peaks form, about 30-60 seconds. During the last 10-15 seconds, add the confectioner's sugar, for optimal foam. Gently fold into cheese mixture. Separate each ladyfinger into its two halves & lightly dip (not douse!) each side of these halves into remaining (2 Tbsp.) espresso. Start by layering 16 ladyfinger halves on the bottom of a 7" x 11" Pyrex glass serving dish. Spread 1/2 of the cheese mixture on top of the first layer of ladyfingers & sprinkle with a 1/2 Tbsp. cocoa, using a sifter. Layer next row of ladyfingers on top of the first & finish with a cheese layer & then another 1/2 Tbsp of sifted cocoa. (Garnish with dark chocolate shavings if so desired.) Cover with plastic wrap and refrigerate at least 1 hour before serving. Do NOT freeze. Enjoy! Chef's Notes: Do not use the regular, sweetened variety of cocoa, i.e., the instant kind used for hot cocoa. The most commonly found brand in the tea & cocoa aisle of the grocery store is probably Hershey's, and that will certainly suffice. As far as the cheese is concerned, the BelGioso brand commonly found in many supermarket chains is a lot less expensive ($4-5) than the brands found in gourmet, specialty shops (which can sometimes run up to $8-9 a pop). It's just a matter of how much you want to spend on cheese. 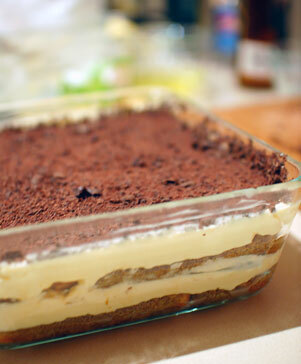 Serving Suggestions: Tiramisù goes nicely with healthy accompaniments like a cold glass of (skim) milk or a cup of herbal tea, preferably a tangy selection like orange or lemon, or a spiced variety like cinnamon or licorice, etc. And then there's also decaffeinated cappucino or decaffeinated tea.